What is Joshua up to these days? My other half, Jeffry, and I made several day trips around Metro Vancouver and northern Washington state to try out new restaurants and farmer markets on our day offs. That is something that we both enjoy doing. Lately, we are obsessed with Steveston Farmer & Artisan Market because they offer really great wines, pastries, fruits & vegetables. We love it when the farmer market offer wine tastings booths - of course, we often end up buying a bottle or 2....or 3. ;-) And we've had some family visit from central Oregon and wonderful spending some time with them and meeting great new friends. You know who you are Russ and Melissa!! Ok, here is some of our favorite online interior design projects that I have worked on in the past few months. This project is for the same client I worked with for their outdoor space shown above. This time, the client wanted to create a "Girl Boss" type office but didn't want pink, yellow or purple for their office. They, also wanted it to be a modern eclectic style as well. This client wanted this office to be an open and inviting space for social gatherings, business meeting, and work at home. I decided to play with patterns including the wallpaper and draperies to make the space more fun and to tie in some existing furniture pieces the client wanted to repurpose and new pieces like the cowhide rug, and chandelier. We love the way it turned out. I worked with a client that is currently doing a major house remodel project to change from a transitional to industrial style home. The previous owner removed the fireplace from the family room so this client wanted to add the fireplace back to the family room. They were concerned about how their new furniture would fit into the space with the fireplace back. I designed wainscoting above the fireplace that works great with the style of the house and new pieces. Can't wait for my client to share pictures on the end result! This client recently bought a new house and was doing some remodel projects around the house. I worked with this client in five different rooms. This particular room, family room - the client wanted this space to be a special space for some quiet time at home as well as for social gatherings since it has access to their outdoor space. The client and their partner both have very different styles and struggled to reach common ground. 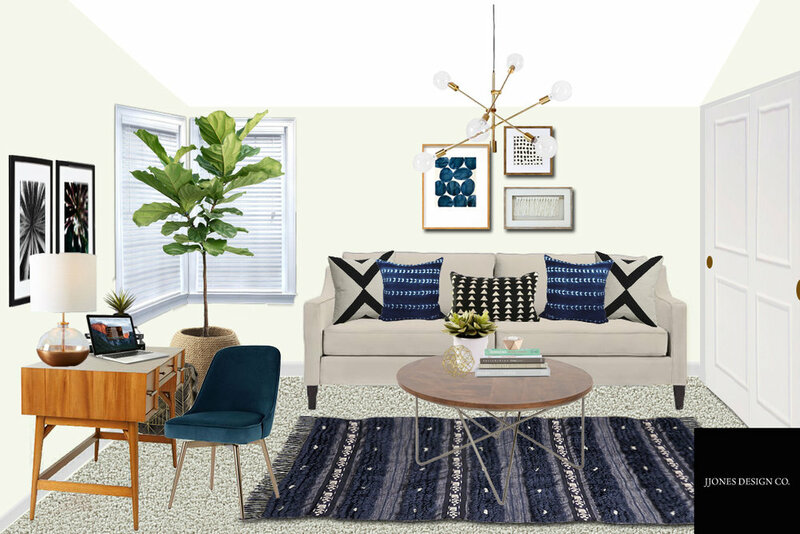 I found a solution that works great for their personal styles - modern eclectic. Since the concept and pieces come from different eras and other styles, it allows some more creative freedom to mix and max, blending two different personalities together into something coherent. You typically see Adobe style homes with a corner fireplace, and many people play it safe with neutral colors or work with natural settings. We went the opposite direction to make a bold and dramatic look for this space. What you see from this drop-on rendering - the blue walls is wallpaper, not paint. 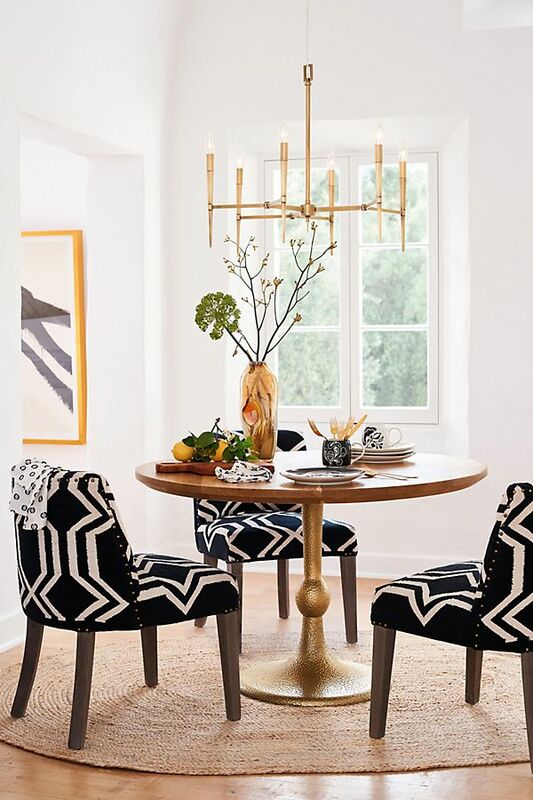 It makes the wall arts, chandelier, and yellow chair stands out more and provides texture to the space. Cool huh? We are in love with the way it turned out. This is one of my all the time favorite online interior design projects. I have worked with this client in the past on another e-design project (family/playroom). This time, we worked together on their home office/guest room. The client wanted this space to be a fun place to work in or for their guests to enjoy when they come over for the night. We chose fun colors - blush, midnight blue, white, and gold for this room. I chose a bold wallpaper to make a statement. It does help make the bed and chandelier stand out more. I managed to make this space work without feeling crowded for both office and bedroom furniture combined. It was fun working on this project! You can see that I have worked with many clients from all over the U.S. and Canada with different styles through our online interior design & decorating services. If you have your own design challenges, please reach out to us. We'd love to help and potentially feature you in a future blog! Where did the time go? Springtime is almost here! I've lost track of time already. In the last three months, I've been working on a bunch of different kinds of e-design projects with amazing people from all over the US, Canada, and Greece. I'd like to share some of my favorite with you. This client wanted a nice playroom that can also work for adults. I suggested the client think about long-term design solutions so the playroom would continue to be functional as the children aged. They could turn the playroom into a family room or teenager hangout lounge and use some of the same furniture. I also recommended a wallpaper to create an accent wall for this TV wall so it would look more stylish for the adult's taste. I work with a client that needed my help to redesign her guest room into a bedroom for her son. 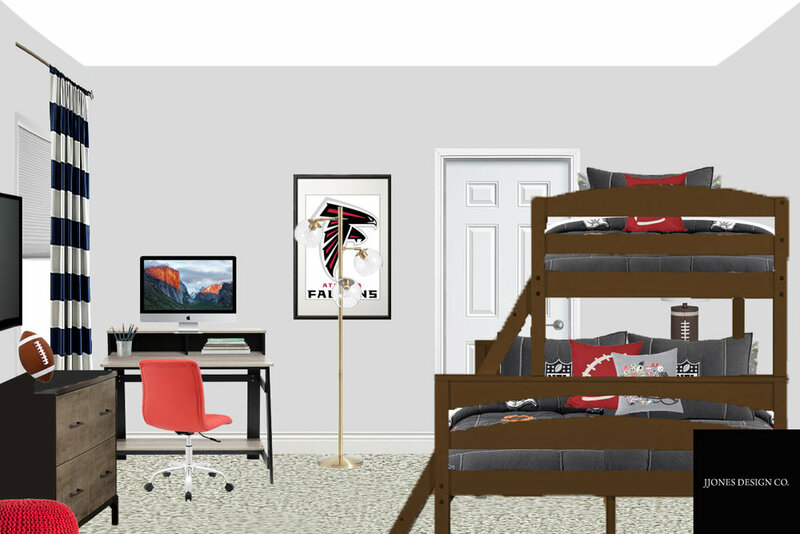 He loves sports and is a huge fan of the Atlanta Falcons and wanted me to include it in his bedroom design. Spacially, it was a bit challenging to design because there are two doors and large closets which made it almost impossible to fit a bunk bed into this bedroom. After a lot of searching, I found the perfect bunk bed that fits the space without blocking access to any doors. Regardless of the challenge, it was fun to work on this project since I don't work with this type of project very often. I was really excited to work on this unique e-design project because I'm a huge fan of high rise lofts with exposed ceilings, visible plumbing/venting, and it had an amazing view of Chicago. The challenging aspect of this project was that the client was considering removing the fireplace to make the space feel bigger. It didn't really take up much space and I was concerned that they would lose a bit of home value if they removed it. Secondly, how to fit all the living and dining furniture into a medium sized area between the windows and kitchen. The client wanted to keep some of their furniture and include the speakers around the space. We managed it to make it work for the family of four without making it look too cluttered. I'm really pleased with the way it turned out. As was the client! 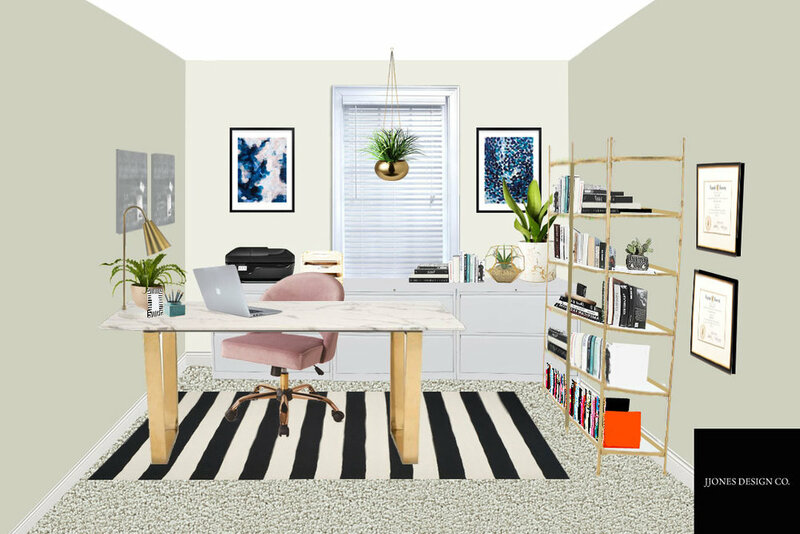 When I was assigned to this project - I got really excited because the client wanted a modern boho style home office/guest room and this is currently one of my favorite styles to work with. I was pleased how the project turned out and it was a dream to work with the client because we were always on the same page with the direction I wanted to go. It was a bit challenging to find a sleeper sofa that would fit in this space since it is is very small and I couldn't block access to the doors when the bed is pulled. This is one of my all the time e-design project favorites. The modern boho office client was so thrilled with the result they re-hired me to design their master bedroom. This was a complete design since the client only had a matress to start and no furniture at all! I made the suggestion to do a blue accent wall, a unique open latticework bed and a fabric billowy chandelier to be the statement pieces for the design. The client loved the furniture and went forward with this design plan for their master bedroom project. This client had just moved into a beautiful new house and needed my help to figure out which furniture layout for the living room space and update the look. They were debating between a layout of two sofas facing each other or having a large sectional and which of the two would make the most sense for this space. I created two different floor plans with both furniture layouts to show. We decided two sofas facing each other would work best for this space because it created more open space and flow in the room. This client had just moved into her new apartment and got a new job that required her to work from home. She needed my help with the home office layout and furniture. It was challenging work on this project because this client wanted a large table that would work with her current table lifter. When she gets tired of sitting all day she needed the option of standing and working. The space wasn't large enough to fit everything that she wanted for this project. I had to look around for right storage/filing cabinets solution that would fit her chair between the table and window wall. I managed to make it work for her needs so she would be able to work in and feel comfortable with the new work environment. If you're feeling inspired and need my help for your own projects - you can get started here. Design Inspiration Photos - How Do I Interpret It? Many of you guys probably have seen a lot of our 2D rendering boards and some of 3D rendering images post on both Facebook and Instagram. I want to discuss with you about behind the e-design works. A little over three years ago, just before I started my e-design business, I had to teach myself how to do 3D renderings of my interior design work so I can show the clients what their space would look like when the makeover is completed. In my college days, my school didn't teach us how to do 3D rendering because it was brand new and wasn't available in my school at that time. Over time I learned a few programs that perform 3D layouts and renderings to do photo-realistic pictures of the space to give people a more realistic idea of what their space could look like after makeover/remodel; it's like the designer's version of CG in movies. I still am in awe that even though I am not a tech savvy person but managed to learn how to do it on my own without taking any classes or have a mentor. After a little over a year of being in e-design business, I decided to join some online design platforms to learn more about e-design industry and expand our client base. They required all designers, including myself, to do 2D rendering boards (it is often called style board, concept board, or look board) via Photoshop. At the beginning, it was a bit challenging for me since I was used to doing 3D renderings. I had to teach myself and master Photoshop in order to create a room with furniture and accessories. In my own opinion, 2D rendering is ideal for anyone that can envision the space or understand the design plan well. 2D rendering is not always helpful for someone who struggles to envision the space but 3D renderings will definitely help anyone to envision the space and able to understand the design plan better.